RER DVD to AVI Converter is outstanding DVD to AVI converting software for you to convert all kinds of DVD to AVI: H.264, MPEG-4, Video for Google Video, Video for Youtube, Video for Myspace, with unimaginable fast speed and high quality. with the simplest user-friendly interface, you can do the job as easy as 1-2-3. Rip all kinds of DVD to AVI easily with fast speed and high quality. 2. Choose any title to convert. 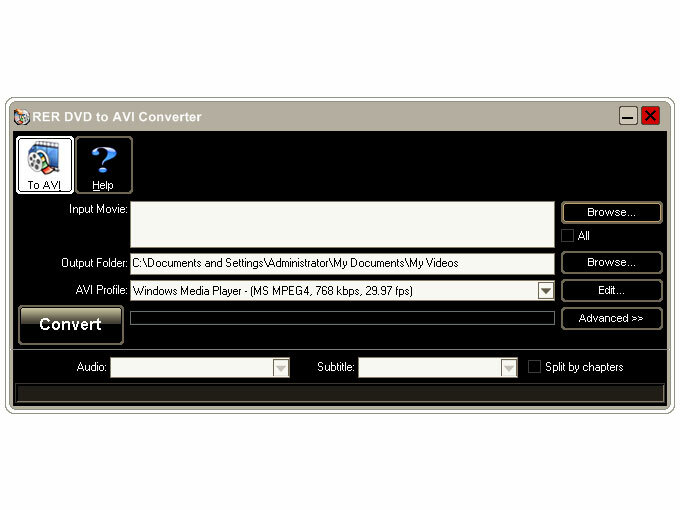 RER DVD to AVI Converter supports selecting a single title to rip and you can rip the DVD by titles and chapters. When do the conversion, you can select the audio tracks and subtitles you want. RER DVD to AVI Converter can keep the original quality of the DVD videos and you should never be worried about the synchronization of the video and audio. Have option to select video size, bit rate, NTSC/PAL, frame rate, audio codec, sample rate etc . RER DVD to AVI Converter is designed in sense of easy use. The program comes with a step by step wizard-like interface and all the functions can be used by simple mouse clicks. 6. Safe to install, viruses- free. We respect your privacy. So there are no spyware and adware in RER DVD to AVI Converter. Qweas is providing links to RER DVD to AVI Converter 3.7.3 as a courtesy, and makes no representations regarding RER DVD to AVI Converter or any other applications or any information related thereto. Any questions, complaints or claims regarding this application RER DVD to AVI Converter 3.7.3 must be directed to the appropriate software vendor. You may click the publisher link of RER DVD to AVI Converter on the top of this page to get more details about the vendor.